It's 1970s France and Suzanne Pujol (Catherine Deneuve) is content. Her husband Robert (Fabrice Luchini) is the director of her late father's umbrella factory. He's having some trouble with striking workers, but that's okay because Robert avoids sharing his troubles with her. Instead, he dumps his problems on his secretary (and mistress), Nadège (Karin Viard). Daughter Joëlle (Judith Godrèche) belittles Suzanne for being a simple potiche—a trophy wife—confessing she is about to ask for a divorce from her own freeloading husband. And son Laurent (Jérémie Rénier) is a student still undecided about his plans for the future. No one is happy, least of all Suzanne, but she's content. Nobody's perfect, right? This is the way life should be. And at least she's happy enough that when she goes for a jog in the morning, the forest animals are attracted to her cheerfulness, surrounding her and serenading her with their soft chirps and purrs like they would Sleeping Beauty. Wait... say what? Potiche is a comedic French confection with a surprisingly potent progressive undercurrent. It's a movie that recalls the Jacques Demy films that starred Deneuve in the 60s, frothy musicals which served as a warm counterpoint to the actor's icy onscreen persona. Her role of Suzanne is surprisingly out-of-character for the mature Deneuve, the part being better suited to an actress 20 years younger. But Deneuve is timeless, still looking not a day over 45. Playing opposite her for much of Potiche is Gérard Depardieu, an actor who time hasn't been as kind to. Depardieu plays Maurice, a labor leader and Suzanne's secret one-time lover. He is negotiating on behalf of the umbrella factory workers to improve the grueling working conditions Robert refuses to change. The stress lands Robert in the hospital, Maurice at Suzanne's side, and Suzanne as the new director of the umbrella factory. 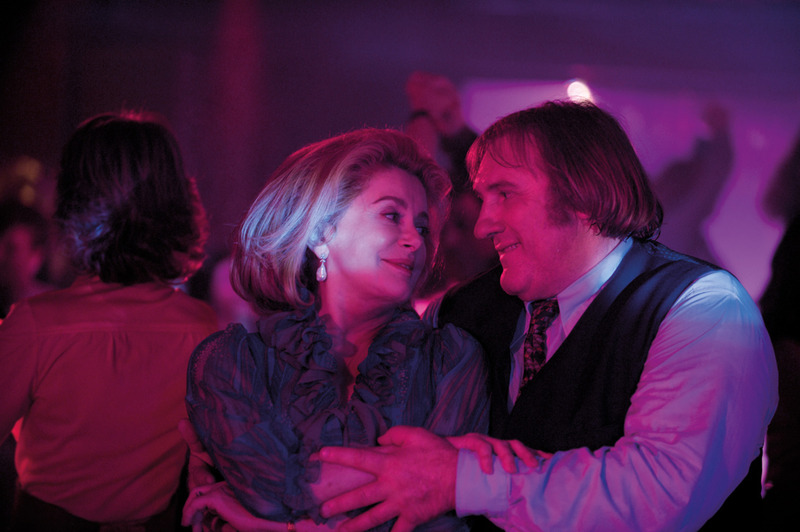 Potiche's most magical moment is when Deneuve and Depardieu share a dance at a French nightclub. It is a loaded moment, charged with the history each actor—arguably the two powerhouses of contemporary French cinema—possesses. You can sense director François Ozon is having his own fun with this. The lightness of Potiche is atypical for a man better known to stateside audiences for darker thrillers like Swimming Pool (2003) and See the Sea (1997). But Potiche is deceptive, getting quite serious when the conversation shifts to the topic of worker's rights, and the rights of women. And with the exception of the pedantic Luchini, the cast is able to effectively modulate the tone of their performances from comic to dramatic in order to accommodate the tonal shifts of this strange little hybrid. For the versatile Deneuve most of all, Potiche is a fitting showcase of her abilities. And she is the main reason to watch Potiche. Potiche is in limited release across the country. It opens today in Atlanta at Regal Tara Cinemas, 2345 Cheshire Bridge Rd. NE, Atlanta, GA 30324, (404) 634-5661, and at Lefont Sandy Springs, 100-152 Sandy Springs Cir. NE, Atlanta, GA 30328, (404) 255-0100.